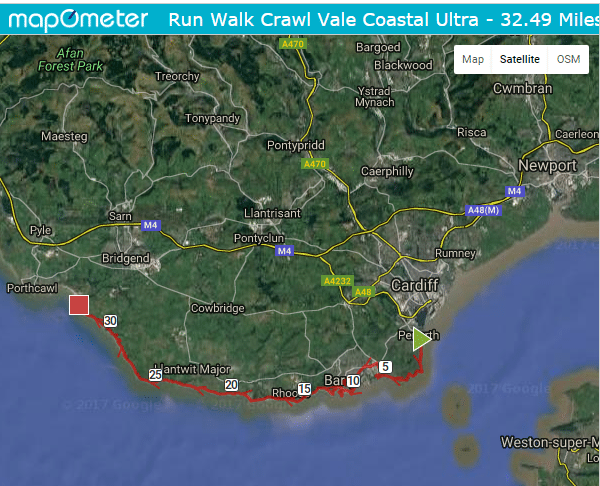 The Vale Of Glamorgan Coastal Ultra challenge is to complete a 32-mile linear route along the entire coast of the Vale of Glamorgan. It is suitable for both runners and fast walkers. There is also a short course option of 18.5 miles taking in the second half of the route. the full course race starts at 08:00 on Saturday morning from Penarth Pier. From here the route follows the Wales Coastal Path, almost entirely on a trail. It hugs the clifftop passing numerously hidden and rugged bays all the way to the splendid beachside resort of Ogmore-by-sea. The route itself passes 19 beaches, with the final 14 miles traveling along the Glamorgan Heritage Coast with its dramatic cliffs, amazing rock formations, romantic coves and rolling countryside. The 18.5-mile race starts at 10.30 at Porthkerry Park, Barry. The terrain is mixed/light trail. This means it combines grassy trails, hard rock trails, tarmac trails, with some road sections mainly around Barry. The last 14 miles of the courses are on the Glamorgan Heritage Coast which is almost entirely soft trail along cliff top fields, and paths. The best type of trainer for the vale route would be a trail trainer which is comfortable for road sections. These are commonly referred to as ‘city-trail’, ‘light trail’ or ‘hybrid’ trainers. If there is a lot of rain in the preceding days, then a more aggressive trail trainer with better grip would be best. The route follows the marked Wales Coastal Path along the entire route. The Vale portion of the Wales Coastal Path is the closest to the sea and the route is very easy to follow. Whilst the route is self navigation, as long as you follow the clifftop and sign posts it is very simple. All of the route follows the coast and the paths are very well marked by Coastal Path signs. It is possible to navigate the route completely using these signs but all competitors will be provided with a marked map and detailed route explanations to help you find your way around the course. There will be 4 manned checkpoints (2 for the short course) which will provide refreshments, usually water, flat coke, tea & coffee, sweets, biscuits, crisps, nuts etc. Details of where the checkpoints are at can be seen on the FAQ page. The link is at the bottom of this page. Both Courses - Friday 1200-2000 at Up And Under Outdoor, Cowbridge Road, Canton, Cardiff. As the route is linear you will need to either get dropped off and picked up or park your car at Ogmore-by-sea beach car park and catch one of the busses provided to the start of the event. The bus will leave Ogmore-by-sea at 06:15 for the ultra, and 0845 for the 18.5miler. If you want to catch the bus you need to select this option when you sign up. You will be able to leave a drop bag at the start that will be transported to the finish for you. This MUST be carried (or worn) at all times and will be checked at registration before recieving your race number. First Aid Kit to include: blister plasters, sterile dressing and bandage or tape. One of the best aspects of the Vale Coastal Races are the great opportunities for friends and family to support you around the course. The following is a list of the best and most accessible places. A more detailed description of the above places will be sent out with the event details one week before the event. The time limit for the event is 10 hours (6pm) so it is suitable for anyone who can maintain a good running/walking pace of 3.2mph. The time limit for the half course is 7 1/2 hours so is suitable for anyone who can maintain 2.5mph! There are generous cut off times- we give you 4 hours to get to 13.5 miles! Do I need to carry all the compulsory kit? YES. On both the ultra and 18.5mile courses you must carry all the compulsory kit. I am in a team, do all team members need to carry all the compulsory kit? YES all team members must carry the whole kit. This includes all of it... first aid kit, map, compass…all of it! Will there be a kit check? Yes. You will be required to show a number of random items from your kit before you are allowed to register and receive your race number. No kit = No number. You have been warned! All podium finishers will also be kit checked at the end. In terms of navigation we would rate it as easy to follow for a competent navigator. The route is marked with Wales Coastal Path Signs, it follows the coast and there are lots of other runners on it. You also receive a map with the route marked on it and there is a GPS file on the webpage which you can download. We also add some extra signs along the route. Conditions for the race were pretty bad. Some constant heavy rain for a week prior and the damage had already been done. Past Barry it was pretty much mud all the way with some added waterlogged fields and stream crossings, shin high just for fun.Registration was open a day earlier at Up and Under in Canton, so if you were fairly local and could make that it took the whole stress out of the morning of the race. Kit check was also completed at registration. The start of the Ultra takes place at Penarth Pier and the pier was opened by the race organisers that allowed runners to stay warm and more importantly dry. Facilities here were good with a number of toilets available inside and outside on the pier. The race brief covered everything you needed to know and you were issued with a card to stamp at 2 locations at Barry Island to prevent any short cuts. Support for the route was fantastic especially where the CPs were located and through Barry Island where there was a Park Run happening.The route was very coastal from Barry onwards and even though the race organisers described the route as flat, it was far from it...many up and downs ‘coastal style’ and three pebbled beaches required crossing, adding a certain degree of difficulty to the course...throw into the equation the mud and waterlogged fields and you have yourself some demanding sections to deal with along Route. The route was well marked out to prevent any confusion and the coastal path was fairly easy to follow away from the tac signs, only once did I take a wrong turn down to a beach to then take the challenging 40 steps back up after I realised I took a wrong turn at a track junction...The aid stations were fantastic with a great range on the usual ultra snacks including sweets, coke and crisps.The t shirt and medal were good quality that rounded off a good but if not demanding race.I would recommend this to others in the future. I should start this review off by saying that I hated every minute of this race! But that was more to do with the terrible weather conditions and my dislike of mud and water than any issue with the race itself. The organisers did a fantastic job to hold an event in what were extremely challenging conditions while keeping it safe and fun. The aid stations were really well stocked, and the marshalls and general support were great. This was a really well organised event. Coach was on time (although you couldn't buy a car park ticket as the machines were locked till 8am, so one for the organisers to check) . Registration was quick and professional. Briefing clear. Started on time. Aid stations were well stocked and friendly. Loads of mud (which we were warned about). Ultra was 2 miles over distance stated. Good medal and t shirt. Generous cut offs. All in all a great experience with jaw dropping scenery. Would sign up again.